Saturday morning at Sound Bites! After realizing that it was way too late on a Saturday morning to head to Friendly Toast because of the impending long line, I went in search of another option on Yelp. Having heard good things about Sound Bites in Ball Square, we decided to head out on a nice walk there - in hopes of a breakfast that would live up to its reviews. When we walked around the corner onto Broadway Street we saw a mass of people and got a little nervous. We realized that the mass was actually two different lines of people waiting outside two breakfast places - ours, Sound Bites, and Ball square Cafe. It was already almost 11am, so we had no one to blame but ourselves for not getting up earlier and getting there before the crowds. Thankfully though, a server came outside and asked if there were any parties of two interested in sitting at the bar. Yes, please! Sitting at the bar definitely beats waiting outside in line for a half hour, even if it is nice out. I was surprised with how large the restaurant was when we walked in. Yes, the actual chef, not the blog. The blog had its 3 month birthday yesterday actually. Thankfully I didn't have to make my own birthday treats because I have so many great people in my life who treat me at this time of the year to their homemade goodies. In fact, it all started over a month ago. My mother took a recreational cake decorating class and so she showed up at my apartment in March with a cake from her class she had been practicing on - I saw that it said Happy Birthday Elise, until she pointed out that, in fact, it said "Happy Birtdy Elise." While practicing her letters she realized she had made them too big and wouldn't be able to fit the entire word, Birthday. Close enough - and what really matters is that the cake was delicious on the inside and the frosting was even better. After a bit more practice, she was able to fit all of the letters and still keep the cake delicious! I love chocolate cake, so that's always my birthday request. The only other thing I asked for was pretty frosting colors - which definitely came through in the pink and orange theme. So thank you mom for making me two birthday cakes this year, even if one was for practice and a month early! I'll have to get a little cake decorating lesson from my mom next time I have a cake to make. In addition to two birthday cakes I also got two sets of cupcakes, ice cream from JP Licks and two lunches out! I know - I was a little spoiled with treats this year. I bought a fresh pineapple and cut half slices, pinning them onto the ham with toothpicks. Cherries are a nice addition too! What to do with that leftover bunch of parsley? How many times have you come across a recipe that calls for fresh parsley, for garnish? A lot. Parsley doesn't often change a lot in a recipe, but there are some recipes out there that have convinced me to buy that bunch of fresh parsley from the produce section. Inevitably I end up using a couple TB of it and then have an entire bunch of fresh parsley left, which doesn't last very long in the fridge. Along the same lines as the bunch of cilantro I had left a few weeks ago, I decided to try out a similar concept with my leftover parsley. Chimichurri is a typical Argentinean marinade/condiment - usually served with grilled steak, another Argentinean speciality. The most important part of Chimichurri is using lots of fresh parsley, and since I had it on hand this recipe is a nod to this flavorful green sauce. Spice and Rice is Nice! "Buywithme.com" is a newer version of Groupon - a site that highlights a different coupon each day, often for restaurants, including this place I've been wanting to try out in Inman Square, Spice and Rice. I was so happy to see it on the site because it gave me a reason to definitely get there and thankfully I have lots of friends that enjoy Asian food of all kinds, which I truly appreciate given I could eat Asian every night! 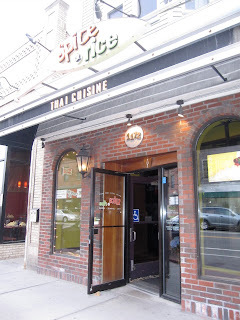 A good 15 minute walk from Harvard Square, the walk to Inman Square is worth it for this restaurant, even if you can find a dozen Asian restaurants a bit closer to the Square. The decor inside is really creative and modern - very colorful. Definitely good for a group with large booths available. The prices were comparable to other Asian restaurants in the Cambridge area and we were all very happy with the dishes we chose. With a mixture of Thai, Korean and Japanese you can make a lot of mouths happy here. The menu is quite extensive - which is why it took us so long to decide what to get. They have the usual sushi rolls, pad thai, bi bim bap and lots of new dishes too. They also deliver, which is convenient to those in the area. Some people have a routine - they wake up in the morning, shower, get ready, eat the same thing for breakfast every morning and then go to work. I am not one of those people. I enjoy variety - and so, I have something different for breakfast every morning. Now that the weather is starting to get warmer I can add smoothies back into my breakfast routine! It's also a good breakfast item to grab and take with me on my walk to work if I'm running a little behind. I'm always looking for new ideas - so feel free to share your favorite smoothie! *I like to buy fresh strawberries, rinse, slice and freeze in advance. Directions for any smoothie are easy - put in blender and mix! It helps to put the liquid in first, then the ice. If your smoothie seems too thick, just add a bit more liquid a little at a time. I like the yogurt and flaxseed additions because it gives the smoothie a little more substance and it's more likely to keep me full through lunch. Last but not least - Red Wine Berries for Dessert! Despite the fact that it's not quite berry season yet, I had quite a bit on hand and they were good. Not too sour or sweet, and a good price at the grocery store! I thought that making a dessert with berries might be a little healthier and a nice light end to our rich meal. I also had ricotta I wanted to use and seemed to remember seeing berries and ricotta put together before. After eating a bit too much of the Mediterranean White Bean Dip the main dish was just about ready and it came out of the oven looking beautifully cheesy and golden. Perfect little dish for a group of 4-6 people (we had 4 and I was more than happy to have some leftovers!). An extra plus was getting to use my new red baking dish, with these pretty swirly edges. Ladies Dinner Night - Cauliflower, White Beans and Berries, Oh My! As you saw last week I bought a head of cauliflower and used 1/2 for the Curried Cauliflower Soup, which meant that I still had 1/2 left. With my ACIS ladies coming over for dinner Sunday night I knew I wanted to incorporate this cauliflower into something, but I didn't know what. 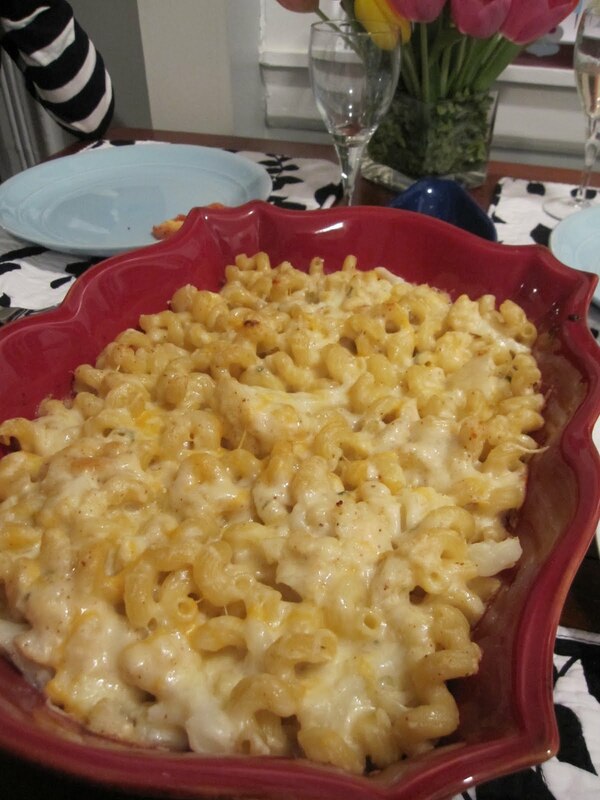 Then I remembered I saw Rachel Ray use cauliflower in a mac and cheese recipe, and I thought - that's perfect! I'll note that the ladies have very different food preferences - 1 vegetarian, 1 vegan-to-be and 2 we'll eat anything kind of girls (yes, one of those is me), so I knew I wanted to make something vegetarian, but still filling! This was the first dish I decided on for a little something to nibble on while my friends arrived, I was still cooking and for catching up over wine! April Showers Bring May . . . Herbs? Another plus of my new apartment - I have a little porch outside! So with beautiful weather and almost 70 degrees outside today I took advantage of it. I cleaned off the porch, moved my little wooden ikea cart out there and did a little spring planting! 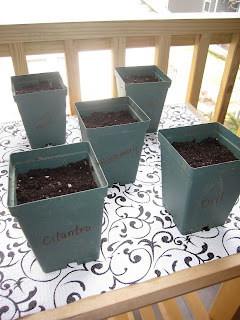 I've never really planted anything on my own before, from seeds, so I really hope that in a few weeks I'll start actually seeing the beginning of some herb plants. Having fresh herbs to cook with makes such a big difference. I'll be sure to let you all know if they start growing anytime soon and then I'll have some recipes to share with my fresh herbs: two types of basil - a citrus lime basil and a sweet basil, cilantro, rosemary and dill. Fingers crossed I find that I have a green thumb in addition to my cooking skills! I wish that I could buy just a couple pieces of celery at a time, but instead it tends to come in giant packages with so much celery I don't know what to do with it. You can only eat so much celery and peanut butter, and you don't usually use more than a couple stalks for a soup dish. Cream of celery soup doesn't really excite me either, so I had to be a bit more creative than that. I also noticed a fresh looking head of cauliflower on sale at the grocery store this weekend, so I had that to play with last night for dinner too. Despite getting home from work late I still had enough motivation to try out this new soup, which I threw together on a whim around 7:45. I was sitting down to dinner by about 8:45! I was also motivated to finally open and setup my new blender, which was an extra incentive to try this dish. 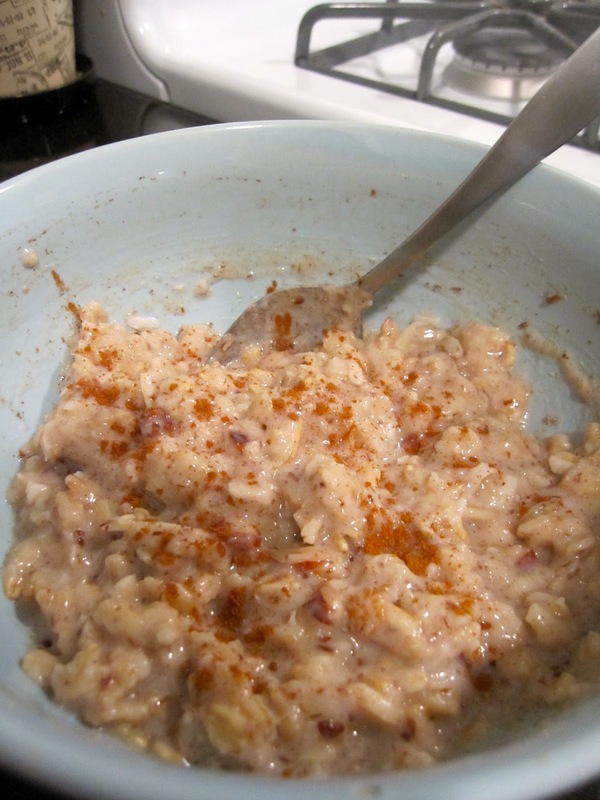 I know that oatmeal is good for me - a healthy, filling breakfast to get me through to lunch, but I can't seem to get into it enough to eat it every morning. I like trying different kinds - adding cinnamon and cut up apple, or frozen blueberries. I'm trying to be better about eating plain oatmeal and not the oatmeal packets, so when I had some leftover coconut milk I needed to use I thought it would be a good addition to my oatmeal! Coconut Almond Oatmeal all finished!